(Nanowerk Spotlight) Interaction forces between contact surfaces, such as the adhesion and friction forces, are crucial in many applications at the nanoscale because of the high surface-to-volume ratio of nanomaterials and nanodevices. Over the last decade, various solid lubricant materials, micro/nano patterns, and surface treatment processes have been developed for efficient operation and extended lifetime in MEMS/NEMS applications, and for various fabrication processes such as nanoimprint lithography and transfer printing. One of the important considerations in applying a solid lubricant at the micro- and nanoscale is the thickness of the lubricant and the compatibility of the lubricant deposition process with the target product. Graphene, an atomically thin and strong carbon material with low surface energy, is a good candidate for these applications. The frictional characteristics of mechanically exfoliated graphene (see: "Frictional Characteristics of Atomically Thin Sheets") and epitaxial graphene (see: "Friction and Dissipation in Epitaxial Graphene Films") have been studied by friction force microscopy at the nanoscale, revealing significant reduction in friction. From a practical viewpoint, large-area CVD-graphene holds the greatest promise as a solid lubricant because of its excellent scalability and transferability. However, the tribological characteristics of CVD-graphene at the micro- and nanoscale have not been reported. Our recent paper in ACS Nano ("CVD–Grown Graphene: The Thinnest Solid Lubricant") demonstrates the feasibility of using large-area CVD-graphene as a solid lubricant. We report that CVD-graphene has superior adhesion and frictional properties at the micro- and nanoscale, sufficient for practical applications. In particular, our results show that multilayer graphene with a thickness of a few nanometers has a coefficient of friction comparable to that of bulk graphite, a conventional solid lubricant. The results establish, for the first time, the new possibility of using CVD-graphene as a surface coating for reducing adhesion and friction forces and protecting the substrate surface. 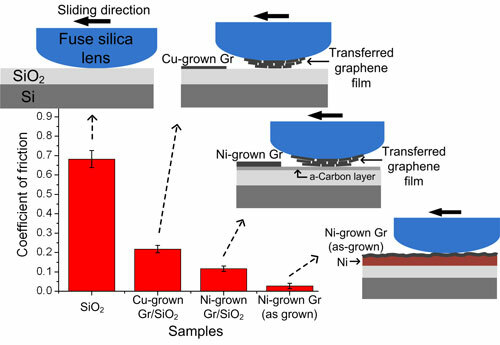 As mentioned in our paper, the thicker Ni-grown graphene transferred on SiO2 was more durable against sliding than the thinner Cu-grown graphene on SiO2, but the most of Ni-grown graphene was also worn easily under the contact pressure of 37 MPa at microscale contact. In contrast, interestingly, the as-grown graphene on Ni showed the lowest coefficient of friction (0.03), and was only slightly worn from the substrate even after repeated tests at the same location on the sample. It appears that the decrease in the real contact area between the fused-silica lens (counterpart materials in the friction test) and the graphene, and the strong adhesion between the graphene and the underlying Ni layer contributed to the lowest coefficient of friction and low wear. The results suggest that the frictional and wear characteristics of the multilayer graphene can be improved when the graphene is bonded tightly to the substrate and have nanoscale patterns on the surface. Our goal is to develop ultrathin and very durable solid lubricants using graphene. We will investigate methods to improve the tribological properties of CVD-graphene for practical use. We also try to modify the surface properties of graphene and control the tribological properties for various applications. Through the future works, CVD-graphene films can be used practically as solid lubricant for reducing the adhesion and friction forces and extending lifetime in MEMS and NEMS.